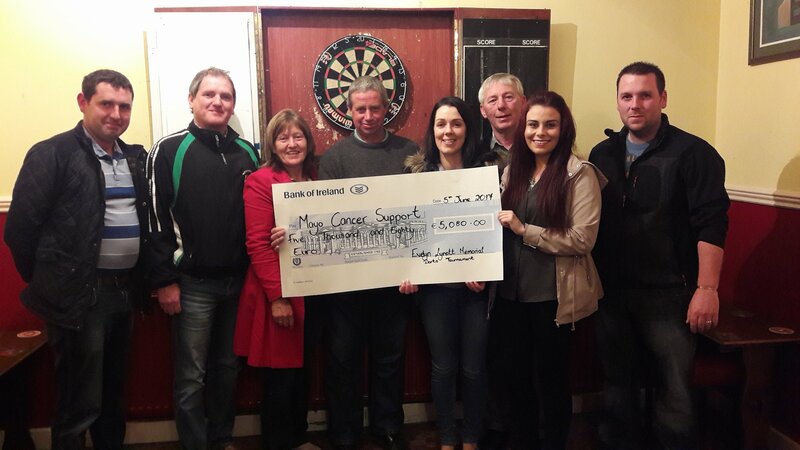 The Organising Committee and Family of the late Evelyn Lynott presenting a cheque for €5,080 to Trisha Greavy, General Manager, Mayo Cancer Support, Rock Rose House which was raised recently at The Evelyn Lynott Memorial Darts Tournament in Bonniconlon. 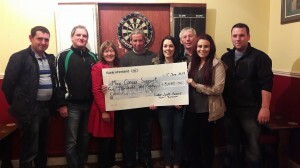 Absent from the presentation was Gerry Curley, Office Pro who was the Main Sponsor for the event. Well done and Sincere Thanks to all involved. Pictured L to R: Patrick Walsh, Michael Ginley, Christine Greavy, Joe Jordan, Lorraine Lynott, Trisha Greavy, Padraig Lynott, Shane Lynott.